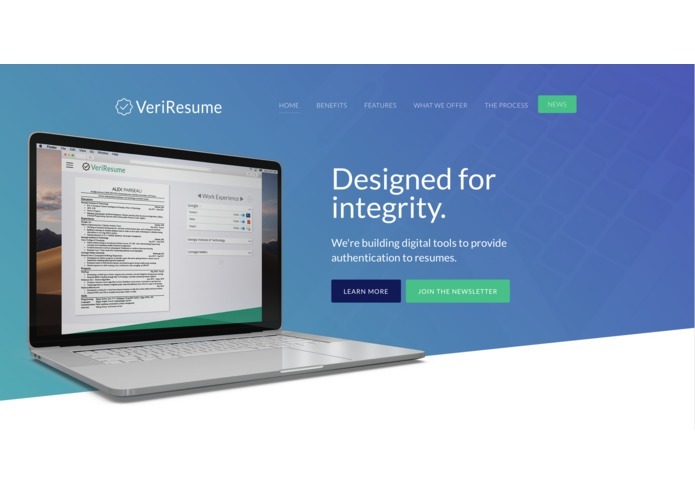 Frustrated with the growing prevalence of resume fraud, we decided to create a solution that would address the issues with current verification while also benefitting applicants. After much brainstorming and research, we decided to take the approach of creating an online platform where individuals can upload their resumes as well as any supporting documentation to help evidence their claims. By placing critical documents such as transcripts or reference letters just a QR scan away, recruiters are saved overhead costs and effort. 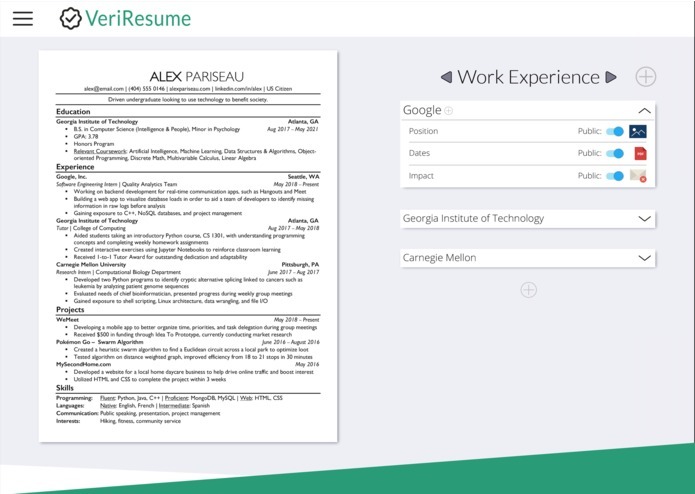 Meanwhile, for applicants, VeriResume manifests as an opportunity to add greater depth to their profiles. Throughout HackGT, we developed out the full stack for VeriResume and focused on the applicant-facing interface. Applicants can now easily upload relevant documents to evidence aspects of their profile and can view changes in real time. Adding sections and experiences on VeriResume is intuitive and simple. The process closely mirrors that of making a bare-bones bullet point version of your resume and can be done in just a few minutes. We've also written scripts to automatically stamp a given resume with a QR code pointing to the specific applicant's VeriResume profile! We built VeriResume using React, node.js, mongoose, MongoDB, HTML, and CSS. We learned as we went when it came to understanding how these technologies worked together in a full-stack application. We were able to use our previous software development experiences to inform decisions throughout the process. In creating the back-end for VeriResume, we ran into multiple challenges over a 24-hour period that jeopardized the project. We were having difficulty getting the calls to the MongoDB database to update the state of the application, as defined by Redux. This was resolved with further research as well as thanks to help from the incredibly helpful Robinhood engineers near our workstation! We also ran into problems caused by the non-relational nature of MongoDB. At one point in our code, we had mistakenly assumed the documents within a collection had some sort of inherent ordering. This led to cryptic bugs down the line, and we had to retrace our steps and add additional pre-processing to solve this problem. We're ecstatic to have a fully functional back-end, modular front-end, and live demo up and running just over the course of the last 36 hours. The progress we've made so far not only shows the viability and ease-of-use of VeriResume, but also puts us in a position to both spread our message of trust and transparency more effectively. Development is tricky-- but discouragement is the only real failure! We've definitely had a few rocky patches over the last two days but as a team, we learned to work together and to tackle new bugs and issues with determination rather than a mindset of defeat. As much as we learned technical skills that are invaluable to us as growing software engineers, what was most invaluable was seeing out collective optimism and vision manifest itself throughout HackGT. We want VeriResume to be more than just a hackathon project. We truly believe it has the scope to influence (and perhaps change) the current environment of recruiting, especially within the tech industry. Current verification methods are often cost-prohibitive, and there is currently no industry standard for verifying the legitimacy of candidates early on in the hiring process. VeriResume not only offers something new and refreshing, but also a product that has a clear industry need. Our plans are to continue developing over the remainder of this academic semester and to conduct further research into viability by speaking to recruiters interested in using the product. 2nd year computer science major at Georgia Tech. I am interested in backend development and data science.